Nepal Rastra Bank (NRB) on Sunday launched a comprehensive database on financial inclusion that consistently measures people’s use of financial services across Nepal. The Nepal Financial Inclusion Portal has been set up by NRB with the support of the United Nations Capital Development Fund (UNCDF) which provides real time information and data to figure out a realistic picture of the financial access and its usage in Nepal. Some of the core functions of the portal are measuring financial inclusion and generating analytical reports to facilitate data driven policy intervention. This innovative tool helps regulatory bodies and financial service providers to report their data in a systematic manner. 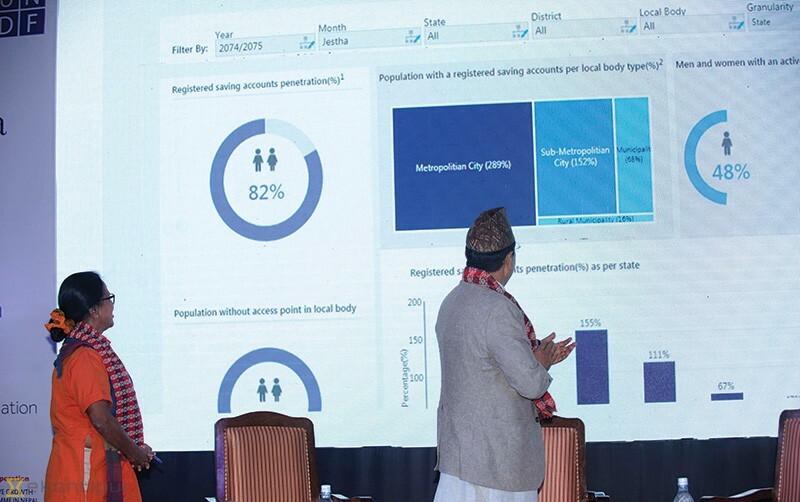 “The availability of data and information on banking and financial access and inclusion helps the government in formulating necessary policies and programmes targeted to the rural areas,” NRB Governor Chiranjibi Nepal said during the launch of the portal. The database will provide information and data from even the most rural parts of the country where the government and regulators can’t reach immediately. “It is very important for policymakers as they can develop policies and financial strategies by looking at this portal,” he said. This portal will help both the government and the central bank in developing the financial infrastructure to increase financial access which is a must for the economic growth of the country, he said. Stating that the country has recently moved towards implementation of the federal structure, he said that the newly launched portal would also support all central, provincial and local governments to make economic development sustainable and ensure that locals are able to have complete access to government services. Ayshanie Medagangoda-Labe, deputy country director of the UNDP, said that the financial inclusion and access could be increased through literacy and use of technology. She pointed out various barriers for the financial inclusion like lack of literacy, distance that people have to travel, lack of savings and income and trust in banking or financial institutions. Lauding that Nepal has been progressing ‘slowly and steadily’ in the journey of achieving the Sustainable Development Goals (SDGs) by 2030, she said that the initiative is a very good opportunity for Nepal which has been championing the SDGs and currently implementing the federal structure. “One of the aims of the SDGs is to leave no one behind. The challenge that we have in front of us is how to get the financial access, literacy, infrastructure and technology to these 753 local units,” she said. Similarly, Francois Coupienne of the UNCDF said that the data offers tremendous opportunities for policy makers. “If the data is available, you can know the needs and behaviors of consumers,” he said. “There is a huge gap between the different needs and aspirations of each individual and the ‘one size fits all’ approach of the financial services providers. Innovation, technology and data will play a key role in filing this gap,” he added.